When it comes to fruits and vegetables, there are many colours that occur naturally. From the bright red of a tomato or strawberry, yellow peppers and bananas, and the greens of broccoli, spinach, and kale, there is a rainbow of nutritious options available. An often-overlooked colour we don’t tend to think about outside of carrots, however, is orange. 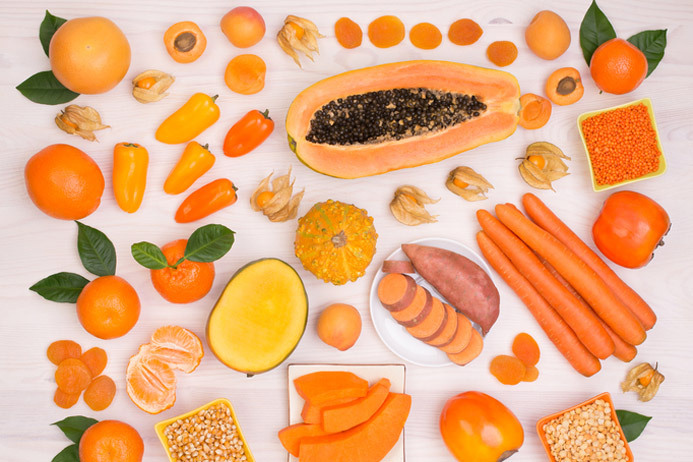 Foods that are naturally orange carry some substantial health benefits along with their bright colour. Orange vegetables receive their colour from what’s known as beta-carotene, which is a form of vitamin A that acts as an antioxidant. It helps to improve eyesight, promote healthy skin, and support our immune system. These vegetables also usually contain vitamins B6 and C, lycopene, potassium, flavonoids, and phytonutrients, which can help to prevent some diseases. Along with these great things, orange foods have also been shown to reduce blood pressure, lower cholesterol, help strengthen bones and support joints, and fight free radicals in the body. 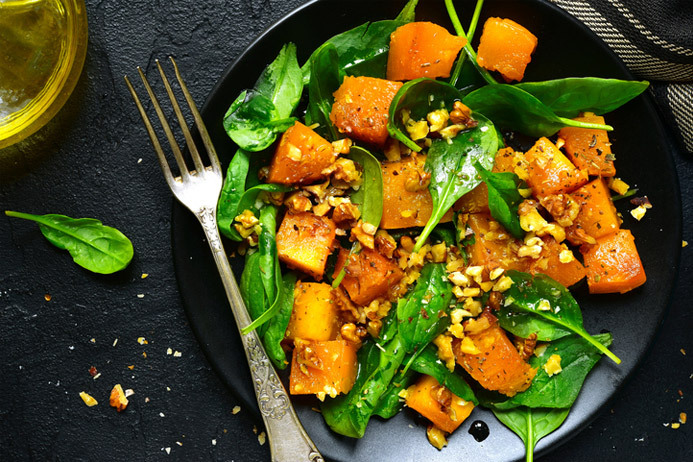 Butternut Squash – This variety of squash is quite versatile and can be used in a number of ways. They are delicious roasted on their own and topped with salt and pepper for a more savoury dish, or cinnamon and brown sugar to bring out their sweetness. You can also mash them as you would potatoes, puree them and put them into soups, sauces, hummus, or into a ravioli filling, or cut them into cubes and use them in pasta dishes or in a hearty salad. Red Lentils – Lentils are an excellent way to make ground meat go further. By adding lentils to your ground meat, you can increase the number of servings without detracting from the flavour. Lentils are also great in soups, dips, and a variety of savoury baked goods. Pureed Pumpkin – We all know that pumpkin makes an excellent pie filling, but there are a variety of other ways to utilize this ingredient. Pumpkin can be used to replace oil while baking, can be added to cookies, bring additional flavour to yogurt, smoothies, or oatmeal, and implemented in many of the same ways as squash for more dinnertime options. If you are interested in the way that the colour of food can impact it’s nutritional value and want to learn how you can encourage others to improve their health, you may be an ideal candidate to participate in online holistic nutrition courses available through the Edison Institute of Nutrition in Canada. For further information regarding our online holistic nutrition courses, including our Introductory Program through to our Diploma in Holistic Nutrition Program, call the Edison Institute of Nutrition today at 1-800-456-9313 or contact us to speak with one of our educational advisors. hello how can lemon improve on my toothacht and skin problems? It will help to improve digestion and elimination which will help your skin. Not sure about a toothache.